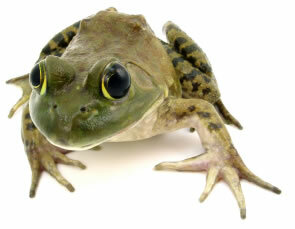 Only 100 years ago if you lived in California or Oregon you might not have ever seen a North American bullfrog. But now bullfrogs are all over North America, and can even be found on other continents. Some scientists think this is a problem because the bullfrog population is growing so quickly in parts of the world where there are no bull frog predators that they are getting out of control. The bullfrog is the largest of all the frogs in North America. Some of them get to be almost two pounds. That is part of the reason that they are in places where they shouldn’t be found. Back in the early 1900’s frog legs became a popular food and people were importing bull frogs around the world so that they could raise them and have frog legs to eat and to serve in restaurants. Bullfrog populations grow so quickly because a female bullfrog can lay up to 20,000 eggs at one time (click to read about the frog life cycle). In places where there are no natural predators to eat the eggs or the tadpoles, most of the eggs live and become full grown bull frogs. Other frogs in North America can only lay about 2,000 to 3,000 eggs and most of them don’t live long enough to become full grown frogs because of the predators. Bullfrogs are amphibians and need to live near water, but when it is warm and rainy outside they will move away from the water and you can find them just about anywhere. A bull frog can jump about six miles in a week and they will hop from large pond to large pond in order to get away from other bull frogs and animals that will eat them. They live by finding small water sources between large ponds along the way, like puddles and small streams and ponds. Bullfrogs like calm water so you won’t find them as much near rivers, but you might find them near the calmer backwaters of large rivers. Bullfrogs will eat anything that doesn’t eat them first as long as it will fit in their mouths. They will even eat other bullfrogs, which is why you won’t find armies of bull frogs in one place very often, and if you do they will be spread out. Groups of frogs are called armies.